Just got back from Ocean City MD. We had a Scrapbooking Weekend. What great fun. 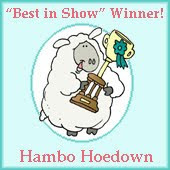 This is a little card that I did while I was there for the Hambo Hoedown. What fun images they have. If you like digital images this is the place to go. I colored the image with copic markers. The background is a background digi image from Hambo too. One of the requirements is that you have stripes on your card. So I penned in stripes on his shirt. That is adorable! Hope you had a fun week-end. What a FABULOUS card!!!!! Beautifully colored and you did a great job using that background! WOW!!!!!! Glad you decided to join along in the Hoedown! Cute card Gloria. Love your coloring & how you created the background. WOWZA! This is a fantastic design beautifully colored! You rocked the challenge! Thanks for playing along in the Hoedown! Love what you did with his shirt. The background makes me wish I had bought it. This is one swell card. awww, what a pretty scene...love your coloring! Thanks for playing along in the Hoedown! Oh my gosh, what a cute card! I love the background, your coloring is awesome as usual! And that lion is adorable, love how you did the stripes on his shirt!